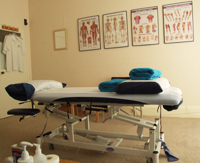 Kelso sports massage clinic, Swedish/therapeutic massage, myo-fascial release. We hold qualifications in Sports Massage, Therapeutic Massage, Advanced Myofascial release and Kinesiology taping. Mark trained with Premier Training International in Glasgow. To further his understanding of Sports Massage he undertook an advanced course with the Scottish School of Professional Massage in Peebles. Great for preventing injuries and great lifestyle choice to increase wellbeing. Ongoing learning is an important part of continually improving as a Therapist. Being a member of the Institute of Sport and Remedial Massage (ISRM) and Complimentary & Natural Healthcare Council (CNHC) assures you, the client, that Mark has done a minimum of 40 hours per year of extra training. Both these governing bodies set high ethical standards and a minimum entry requirement. TO HELP EVERY INDIVIDUAL WHO WALKS INTO THE CLINIC REACH THEIR GOALS, FEEL BETTER AND LEAD A LIFE WITH MORE ENERGY.